TO WILLERSLEY CASTLE, AND THROUGH MATLOCK DALE. FOR the sake of a regular continuation, I shall begin this excursion where the first ended. 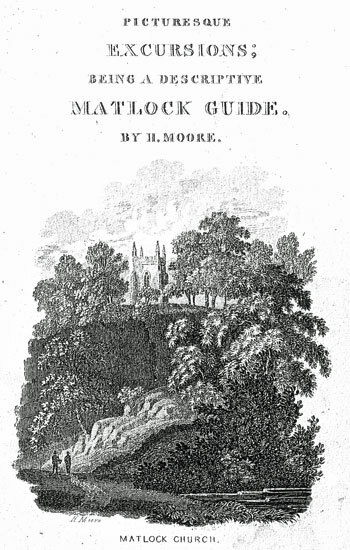 From Cromford, the entrance into Matlock-dale is through Scarthin Nick,* so called from the name of the rock (being Scarthin) through which this road is cut at its western end. *About 200 Roman copper coins were found here ; some of which were in good preservation. stations. Passing through this portal, we have an instantaneous view of Willersley Castle, the elegant mansion of Richard Arkwright, Esq. It was built by his father, Sir Richard Arkwright, and is of a beautiful freestone, that contrasts charmingly with the woody eminence at the back of it. The knoll it stands upon declines from the front, rather precipitously, and then gently slopes to the river. In front the ground forms a fine extent of lawn, but it is unhappily too much spotted with trees, which give it the appearance of an orchard ; and thus spoils a fine appendage to an elegant mansion. A few clumps judiciously placed might have had a good effect. It is to be regretted that so many trees are suffered to grow at this end of Scarthin Rock : if some of them were cleared away, those impending crags, with the rich fringe of trees on their summits, would appear with peculiar advantage in a picturesque point of view ; and from this station would make the principal object in a good prospect down the river, and render this spot still more interesting, which already commands a good view of Willersley Castle, another of Scarthin Nick, with the Cromford rock seen through it; likewise one up the dale, where Harpedge rises precipitously from the road, and is a good object. In the view pointed crags start out on its summit, giving it an Alpine air, and a character different to the rest of the eminences in the dale. What a pity to plant it, so as to destroy this leading character! Had the plantation been confined below the summit, so far as to leave these points naked, a pleasing contrast would have been produced; but now, a few years will render it only a wood of formal fir trees. Plantations are to be seen in every part of the kingdom, but the grand diversity of rocks we meet with here are seldom witnessed ; planting, therefore, should here be a subordinate consideration and used as a set off and contrast to the grand and leading features of the country, and not become the principal by hiding them. Uncouth and crude deformity, and interesting wastes, cannot be better dealt with or Improved than by a thick covering of trees If in this neighbourhood the spade was used with more caution, and the axe with greater judgment, the scenes (beautiful as they now are) would still be improved. the ground; which, underneath a large rugged rock, is absolutely necessary for preserving the picturesque effect. If, instead of the regular slope, the ground had been undulated, it would have given the road a wavy appearance, and would have better associated with the rude crags. Richard Arkwright. It is of a red sandstone, neat and commodious ; although the design are proportions are inelegant. The tower is too small for the body of the church, and the whole is a futile attempt at the Gothic stile of architecture. A little beyond the bridge the grounds are entered at a small but neat lodge, from whence the road ascends gradually to the castle, which is not shewn. It contains some pictures by that excellent artist, the late Mr. Wright, of Derby. Amongst the portraits is a fine whole length of the late Sir Richard Arkwright ; he is represented as sitting in his study, with one hand resting on table, whereon is placed an essential part of the machinery that he invented for spinning cotton : here is also a view of Ullswater Lake, by Wright said to be his last performance, and is most likely the best landscape he ever produced; it certainly a very fine picture. Mr. Arkwright purchased it for 300 guineas. An amateur once met with at Matlock Bath had seen this picture, and was so enraptured with its beauties, to declare it was worth 1000 guineas, and if he had been at the sale, he should himself have gone as far as 600 guineas for It. This gentleman not I being there was unfortunate for the seller, but otherwise for the purchaser. As from the terrace we survey the varied scenery around, we again admire the situation chosen for this mansion; it is elevated, yet surrounded by much loftier eminences: even Scarthin, directly opposite, does not interrupt the view of Cromford Moor, with its extraordinary gritstone rocks. The walks in the wood, that covers the eminence at the back of the castle, are very romantic, winding in a circuit of about a mile. Another walk follows the course of the river, but at a considerable height above the stream, leading by rocks that are extremely picturesque, with trees growing out of the chinks in a very extraordinary manner, so that we are surprised that they obtain sufficient nourishment to support their luxurious foliage. Some of these form pretty scraps for an artist. This walk ascends to the summit of Wild Cat Tor, from whence we have a sudden display of the beauties of Matlock-dale ; a vast ridge of rocks, crowned by a variety of fine trees, whose luxuriant foliage flows down their grey fronts in the most playful manner, form the eastern side of the dale; the steep declivity from their bases to the river, is cloathed with a thick wood. On the opposite side are fine trees, whose pendant branches dimple the stream, which is darkened by their shadows, and is so gentle as to appear quite motionless, until it reaches the weir, just under our feet, where, dashed into white foam, and wild uproar, it forms a powerful contrast to the stark stillness above; this is truly a very rich scene. The Bath houses, Masson Hill with the Heights of Abraham, and the top of the High Tor, are also comprehended in this view. There are, also, other walks that lead to scenery that is highly picturesque, and well worth attention. However, it is now my purpose to pursue Matlock Dale. Having retraced my steps by Scarthin Rock, the road gently descends to some brick buildings, which are a Calvinistic chapel, and the minister's house; near the latter is a good peep up the river. A large cotton-mill, belonging to Mr. Arkwright, is obliquely seen with the cascade mentioned above, and a fine indented rampart of rocks, with a charming variety of foliage, form an interesting back-ground, uniting the whole into a compact picture. A little farther on the road we arrive at the cotton mill, "whose operations," says Mr. Warner, " are so elegantly described by Dr. Darwin, in a work which discovers the art, hitherto unknown, of cloathing in poetical language, and decorating with beautiful imagery, the unpoetical operations of mechanical processes, and the dry detail of manufactures." And slowly circumvolves the labouring wheel below."